Super quick computers and advanced mathematical formulas have largely taken over trading on the financial markets from human beings - algorithms which seem to have a life of their own. Algorithms secretly lie waiting for the moment that your Apple share or your pension money gets on the market. The only ones who understand the system in any way are its architects, the algorithm developers. Haim Bodek is one such algo-developer. After finding some strange wrongdoings he set out on a personal crusade against this elusive system. Welcome to the twisted nooks and crannies of our financial markets. The machinery behind our financial markets, consisting of mathematical models, data centers and miles and miles of fiber optic cables, is disguised by technological complexity and secrecy. The builders of this financial system are a new breed of Wall Street employees - quants - mathematicians and physicists who are responsible for a technological revolution. Haim Bodek is a quant; he specialized in artificial intelligence and worked for Goldman Sachs. He knows the system from the inside, he helped build it. In 2011 Bodek's high-frequency trading company "Trading Machines" went under. According to Bodek the reason was a wrong order type, or the way in which he told the exchange to execute his order. Haim Bodek was invited to tell his story at the "Battle of the Quants" - a recurring event where quants discuss high-frequency trading, amongst other things. Bodek wrote an algorithm for trading machines that would generate guaranteed income - a money machine that weathered the financial meltdown of 2008. But then from one day to the next the algorithm stopped working. 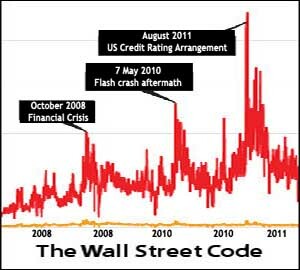 Bodek thought he understood the automated financial markets, but with the help of the social codes within the high-frequency trading world certain traders had found a way to have their orders jump the queue. Our search for the origins of the technological revolution, that has taken place in financial markets over the past few decades, leads us to an even greater trading legend.